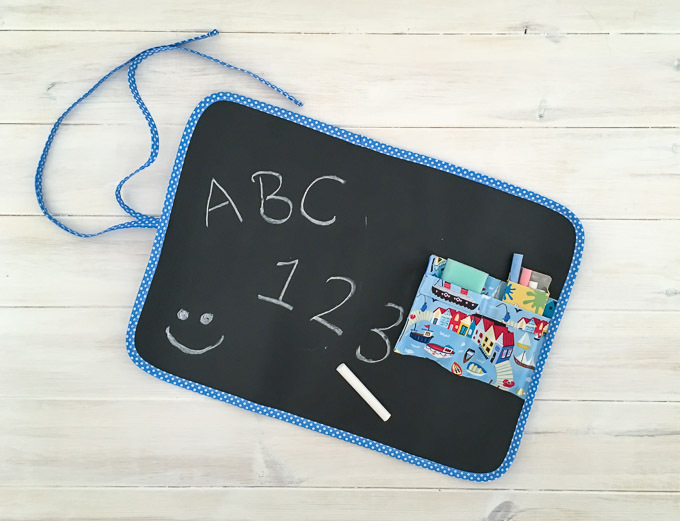 Welcome to Part 2 of my tutorials using chalkboard fabric, in collaboration with Elephant In My Handbag. 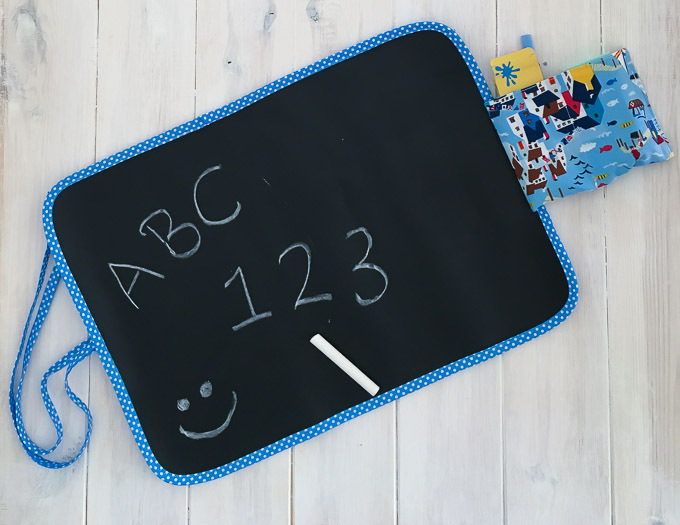 If you missed Part 1, where I share how to make very simple chalkboard embroidery hoop decor, you can check that out here. 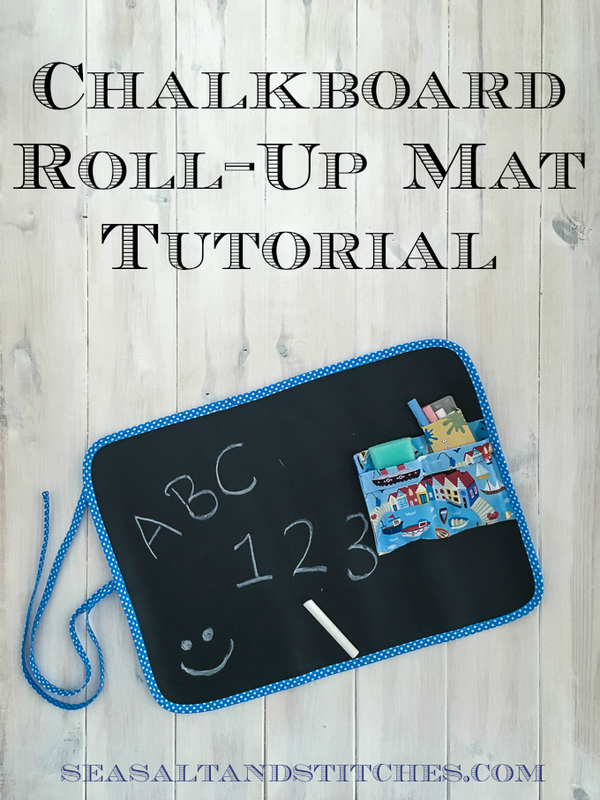 Today I’m sharing how to make a really fun chalkboard roll-up mat. 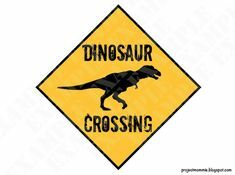 This mat is great to take with you when you are out and about with your kids and find you need an activity to entertain or distract them with, for example at a cafe or restaurant. 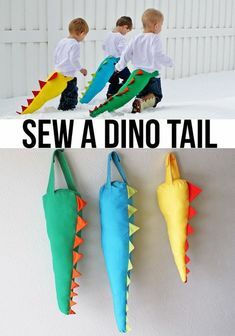 It requires a bit of sewing, but it’s really easy to make, so let’s get started! 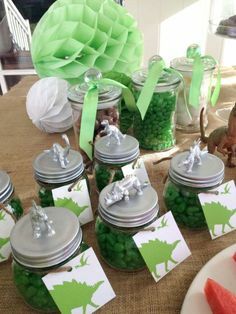 – Don’t use pins as they will leave holes in your fabric. Instead I found quilting clips the most useful. 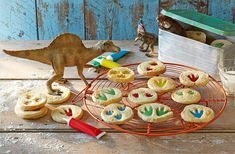 To create the rounded edges of the mat, draw around a glass, or other circular object, at each corner of the chalkboard and backing fabric pieces. Cut. The larger the curve, the easier it will be to sew on the binding! The size of the pocket will depend on the dimensions of your packet of chalk and eraser. Tip: If you can’t find a small eraser, do what I did and make one from a sponge! Just cut the sponge down to the size you want. Clip corners and turn fabric right side out. Press. Keeping the open edge on your right (this will be the edge sewn into the binding of the mat) fold the pocket piece in half by bringing the bottom up to the top. Then fold the upper layer back down by 2cm. Press. Place the chalkboard fabric and the backing fabric pieces wrong sides together. Position pocket piece in the middle of the right hand side of the mat, on the chalkboard side and clamp in place. Fold the tie piece in half and position in the middle of the other edge of the mat, on the backing side. Line up the fold of the tie with the edge of the mat, the loose ends running across the mat. Clamp in place. Baste around the edge of the mat, staying as close to the edge as you can and making sure to secure both the pocket piece and tie. Be very careful sewing over the tie – I suggest sewing by hand turning the sewing machine wheel very slowly, otherwise the needle could break! Now bind the entire edge of the mat with the bias binding. 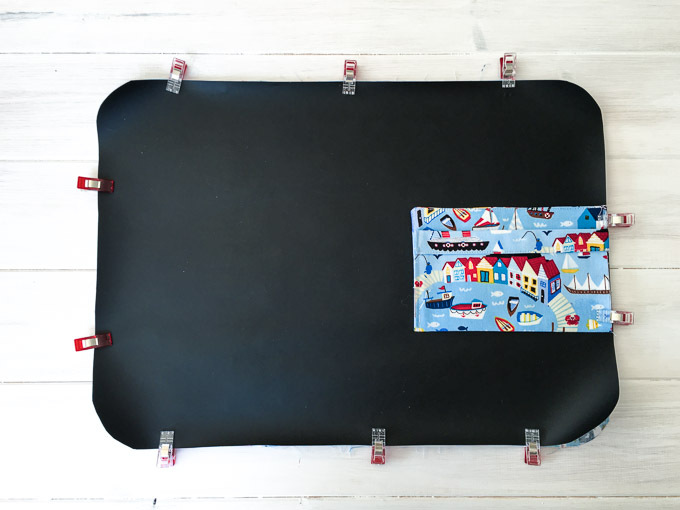 There are several methods for this – I sewed the binding, right sides together with the backing fabric, flipped in over and topstitched it on the chalkboard side. But you are welcome to sew it on in one go, just make sure you catch the underside! Again – be very careful sewing over the tie!!! Well that’s it! 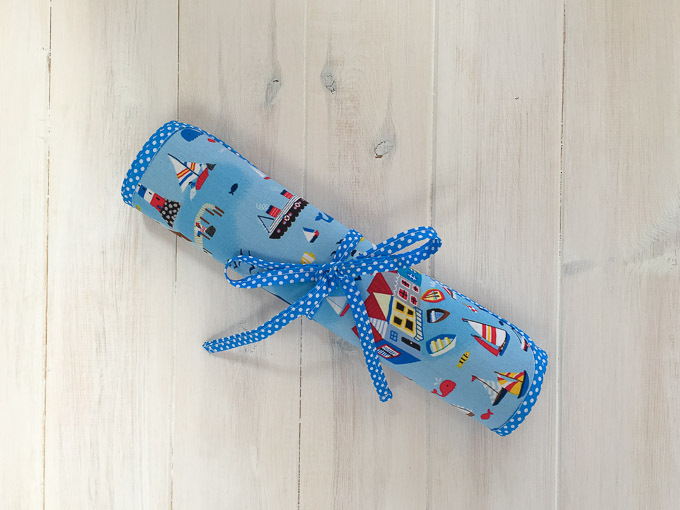 I really love this project, it was so quick and easy to make – and how cute is that Harbour fabric that I used?!! My little man is a bit too little to use this mat at the moment, but I will definitely be bringing it out when he is old enough. If you make one I would love to see your version in action! 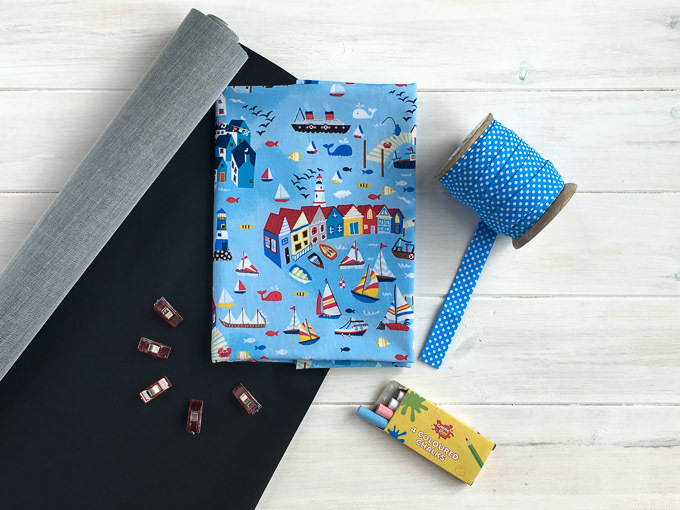 I will hopefully be back next week with a sewn garment (I just need to photograph it – and all sewing bloggers will know, that can take far longer than the actual sewing!). After I announced my Spring Sewing Plans, my parents invited me out to Spain with them, so a couple of maxi dresses got bumped up the queue!